In the last part of the Invisibility cloak we looked at active camouflage and finalized on that method of invisibility, starting this week we will abandon that theory of invisibility and instead move towards a completely different approach to stealth. While we previously found ways to recreate with light what was behind us to appear invisible, instead now we will try to make sure light never gets to us to become invisible. In this part we will explain the general concept of how it works and what it does and in the future we will explain the science behind it and why it works. This time around we will try to make an object invisible by having light curve around the object, the science behind it consist of very advance optic, but in the end we currently already have the scientific knowledge to curve light any way we want. The principle for invisibility this way is easy to understand. Picture a river with a big rock in the middle of it, if you were to have a lot of water, the water would go everywhere around the rock, flowing on each side and over it. The rock would still be in the middle of the river, but you wouldn’t be able to tell from the surface (assume there is enough water that goes over the rock, just as there is enough light to go over an object). Now this all look easy enough, but in nature there is no material that when hit by light will change its trajectory in such fashion, so how could we achieve to bend light that way? The solution is by using specially constructed metamaterial. While this part is labeled metamaterial, we are entering the more general theories of transformation optics, although you will have to wait a bit before I explain what is transformation optics since the scientifically uninitiated will need some more information before I can jump into the subject. For now we will concentrate on metamaterials, what they are and why they are useful for what we want to do. So I keep saying the word metamaterial and it might start to become confusing, so here is a simple easy explanation of what it is; A metamaterial is just stuff we made. The chemical element it is made from is unimportant, what matters is the way it is structured. On to more concrete example for the people who dislike the abstract, please note that the example are really really simplified to ease the understanding for everyone. Let’s say in nature, Carbon (which is an element that can be seen in both charcoal, pencil lead and diamond) is made in the form of long rectangles put right next to each other, a metamaterial would be a material human design for their own purpose since the design of the material in nature doesn’t work for what we want to do. So let’s say we would want for our material to be able to allow triangle to pass through, well we would take Carbon, but instead of keeping it in tightly closed together rectangles, we would make it so there is a gap in between each of them by placing each little rectangle in a triangular shape with one another. This new material we just created doesn’t exist anywhere in nature, we invented it and it will work perfectly for our triangle to go through it. 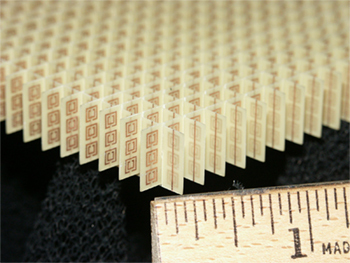 That is a metamaterial. Now we know what a metamaterial is, but what does it have to do with invisibility? Well, this question won’t be fully explained in this post since it is a bit complicated to fully understand why they are important and what is their purpose, but I will still try and explain simply what it is used for. As was previously briefly mentioned, this time around we are trying to hide an object by having light moves around it and never reflect that object, but light isn’t something that can be so easily manipulated and cheated. In order to make a cloak of invisibility we want to have a cloak which will correctly change the path of every ray of light, no matter in which direction they come from. You can imagine that the cloak must be well tuned like a plane, the wind needs to properly move around the wings of the plane to keep it in the air, the same goes for the cloak, where light must move properly around it to keep the thing it hides invisible. To do so, the plane will have his wings slightly curved on the upside and completely flat on the downside, now for light and invisibility cloak…it is much more complicated than that. The concept used to move light around in the right directions is called diffraction and it is a simple Optical Physic principal, which I will explain in Part 7. So, in order to make an invisibility cloak using transformation optic, we need to create metamaterial that bends light around an object to make it invisible, but before we can really understand what is the physics behind this, it is difficult to understand the problem and upsides to this method, this is why the next few weeks will be a quick and easy explanation of Optical physics. Next week we will approach ordinary optics and we will learn more about diffraction and how it is used in the metamaterial to achieve that invisibility cloak. Stay tune next week to expand your knowledge! Tagged blog, invisibility cloak, metamaterial, optics, review, sci-fi of today, science, science fiction, technology, transformation optics. Bookmark the permalink.